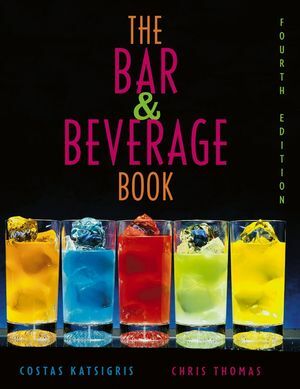 This revised Fourth Edition of The Bar and Beverage Book has the most up-to-date material you need for managing a beverage operation, including bar equipment, sanitation and bar setup, inventory control, and the importance of planning for profit. This edition features added coverage and expert advice on responsible alcohol service; marketing methods; staffing; the latest spirits, wine, and beer; management practices; and current updates in regulations. COSTAS KATSIGRIS is the Director Emeritus of the Food and Hospitality Services Program at El Centro Community College in Dallas, Texas, and Adjunct Lecturer at the University of North Texas in Denton, Texas. He is also coauthor of Design and Equipment for Restaurants and Foodservice, published by Wiley. CHRIS THOMAS is a professional writer based in Seattle, who specializes in food- and wine-related topics. She is coauthor of Design and Equipment for Restaurants and Foodservice and Off-Premise Catering Management, Second Edition, both published by Wiley. Chapter 1: The Beverage Industry, Past and Present. A Brief History of Beer. Alcohol and Health in History. The Tavern: Pleasures and Politics. A Conversation with... Dale DeGroff, The King of Cocktails. Chapter 2: Responsible Alcohol Service. Alcohol’s Impact on Human Health. Alcoholism and Other Drinking Problems. Solutions from a Concerned Industry. A Conversation with... Chris Hoover, Attorney at Law. Chapter 3: Creating and Maintaining a Bar Business. Working with a Designer or Consultant. A Conversation with... George Majdalani, Restaurant Operations Manager. Bar Tools and Small Equipment. Chapter 5: The Beverages: Spirits. Selecting Spirits for the Bar. Brown Goods: Whiskey and Scotch. White Goods: Vodka, Gin, Rum, and Tequila. A Conversation with... F. Paul Pacult, Editor Spirit Journal. A Brief History of Wine in the United States. A Quick World Wine Tour. Chapter 7: Wine Sales and Service. The Role of the Server. A Conversation with... Sharon Goldman, Director of Marketing, Luxury Division, Beringer Blass Wine Estates. Chapter 9: Sanitation and Bar Setup. A Conversation with... George Kidder, Imperial Club Bartender. Chapter 10: Mixology, Part One. Coffee Drinks and Hot Libations. Chapter 11: Mixology, Part Two. Sours and Other Sweet and Sour Cocktails. Developing Drink Menus and Specialty Drinks. A Conversation with... Joseph Takata, Beverage Director. Payroll Taxes, Benefits, and Perquisites. A Concersation with... Christopher Manolis, Executive Assistant Manager, Hotel Grande Bretagne. Chapter 13: Purchasing, Receiving, Storage and Inventory. A Conversation with... Crayne Horton, Co-Founder, Fish Brewing Company, Olympia, Washington. Chapter 14: Planning for Profit. Chapter 15: Managing Your Business. Marketing Tools to Attract Customers. Pricing as a Promotional Tool. Protecting and Expanding Your Concept. A Conversation with... Julie Hansen, Regional Manager, Oregon Liquor Control Commission. What, When, and to Whom You May Sell. Expanded discussion of history and current popularity of spirits. Broader coverage of wines of the world. New material about non-alcoholic beverages, including recipes.